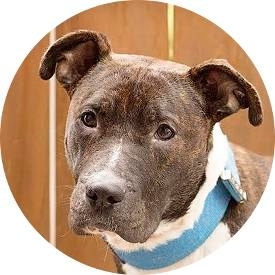 Dino is a handsome young pitbull/pitbull mix looking for his new forever home. He is just under a year old and is about 50lbs, so he’ll likely add a few pounds as he matures. He came to us from a local shelter with a skin condition, which has been treated and resolved. He is housetrained, good with all the other dogs he’s met, and loves to be with his people. Dino is a complete sweetheart and would be pleased to go absolutely everywhere with his new family. He loves to give kisses, and would be happiest if he could sleep in bed. He’s lived with younger children and done well, although he might be too much for very young children – he can be a ball of energy at times. He does calm right down and lay quietly as well. He has also tested well with cats when he’s been introduced to them. He is curious but doesn’t seem interested in harming the cats. Dino’s ideal home would be with another playful dog and a fenced backyard or someone who likes to run often. He is crate trained but will whine at first when put in his crate; he is happiest when he can see another dog when left in his crate. Dino is ready to go to his new home! All of our dogs are microchipped, have been given age-appropriate vaccines, and are spayed or neutered.